Have you have always dreamed of working with sea turtles? Costa Rica offers an abundance of opportunities for you to bring those dreams to life. There are 7 species of sea turtles in the world. Of those, 5 nest on the shores of Costa Rica. All are endangered. Once you learn about their plight against poaching and habitat destruction, you will surely be inspired to help. Saving sea turtles from the brink of extinction. There are many NGOs (non-governmental organizations) working on both coasts of Costa Rica, giving volunteers the unique and memorable experience of assisting iconic sea turtles first-hand. And doing it amidst a spectacular backdrop of sea and rainforest! Sea Turtles Forever – works along the Nicoya Peninsula in the North Pacific region. 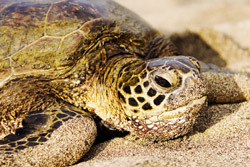 Want to know more about the effort to protect sea turtles? Whether you want to learn some basic facts about sea turtles or your passion expands to interest in research papers, global conservation and job opportunities www.Seaturtle.org may prove a helpful resource. Looking for other conservation-minded things to do in Costa Rica? Consider a canopy tour, take a boat trip or go sea kayaking, do some bird-watching, or take a hot-air balloon ride. And, of course, be sure to visit some Costa Rican Parks & Reserves where nature is being actively protected! Don't just go to Costa Rica to see conservation in action. Aid the effort… visit a sea turtle program!